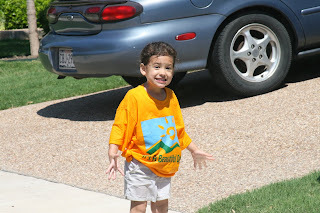 It has suddenly warmed up here in Texas-its been in the nineties the past couple of days! (and it snowed here last month, weird right?) It feels like summer already(much to my dismay-I like Spring weather much more, come back Spring!) 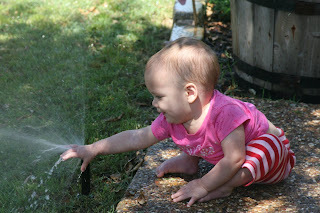 Anyways, we decided to turn on the sprinklers for the kids to play in this past weekend. The kids had a blast running through them. Ella was the most excited and just ran right through them screaming and skipping and dancing. 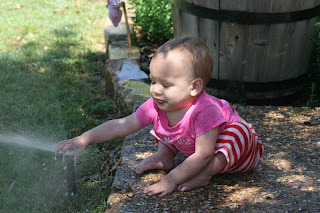 Aubrey was the more hesitant one and took a while to finally get wet. "Its too cold!" she said at first:) Then we sat Cali on the ground next to one of the sprinklers and she had fun putting her fingers in the water. 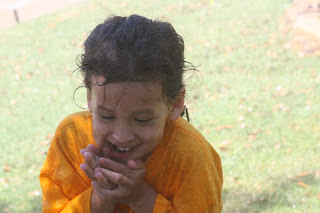 She got soaking wet and she loved it! When I carried her into the house, I said, "Cali did you have a good time?" She just smiled and then did this little full body shiver. 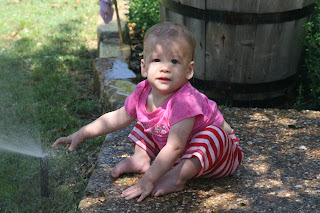 Despite all the excitement, I think she was ready to get dry:) It was a fun afternoon. Joey and I even got in on the action and ran through the sprinklers too. Hey, there are some things you are never too old for! What fun pictures. I love summer. I mean love. It is finally starting to warm up hear. Thank Heavens. I wasn't sure if I was going to make it. How fun! I remember the kids doing that on our road trips at rest stop areas and at home. Looks like everyone enjoyed the coooolll water. Great pictures. Cute pictures! They look like they had a great time. It was 107 here yesterday. Luckily a cold front is coming and it will be in the seventies by wed.
was it after 6 p.m.? are you being a rule breaker again? hahaha. 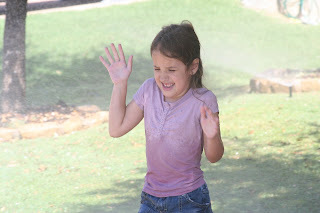 We had the slip and slide out yesterday- the kids couldn't take the heat! Talk about cute pictures!!!! These make me want to run through the sprinklers with them .... you definately would not want a picture of that! I agree with you ... where was spring this year? We have been having 97 to 103 in CA.since April. I want spring!!! We seemed to go from winter to summer too. This is not fair....It is still May after all. Thanks again for your comments on my blog. I'm beginning to feel like you are part of the family.... Can I adopt you? Super cute pictures! Nothin' like running in the sprinklers to cool off. 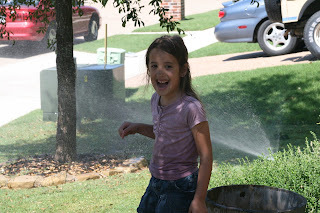 Who needs a waterpark when you have sprinklers? Okay now, so I decided to enlarge the pictures to get a better view. The second picture of Aubrey is hilarious! I'm still laughing. what cute pics! i like how you can see each of their personalities in their pics. and i totally agree with missing spring! have to get out in the fresh air before it's too late! 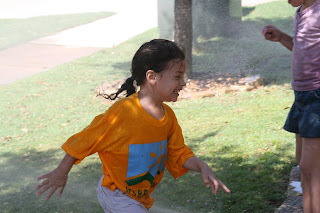 It's been SO hot here too -- I think I want to run through the sprinklers too! Looks like tons of fun! funny you should post this--i've always wanted to do an "adult sprinkler party"--no, not naughty, but with only our adult friends. i think i'm gonna go for it. darling little people over your way! The "adult sprinkler party" sounds like fun!!! Hey Hol, this weekend let's do that, while the kids watch us have all the fun. We'll put them in charge of handing us the towels when it's time to come in. Cheap entertainment for the whole family!love it!